Fantasia is one of the most well-known brands on the hookah market. With over 50 truly unique flavors, they have something to satisfy every taste bud. Most flavors are geared towards sweets, candies, desserts, and mixed drinks. Fantasia Premium Flavored Tobacco is super juicy and you can count on 45 minutes of pure intense flavor. Founded in 2005 and made in the USA, Each tobacco leaf is handpicked and inspected for quality and perfection. The cut is medium choppy and it is usually dyed red. Fantasia not only has creative flavors but they couple them with clever names which isn't necessarily important but it certainly adds a degree of fun to it all. Fantasia has a huge variety to choose from and their 200 gram jars allow for Hookah users to smoke several times a month or with large groups of friends. This size is packaged in a resealable tub with a secondary inner package that is also sealed for freshness. This package is conveniently resealable and when stored at room temperature is sure to maintain its freshness. Fantasia is super juicy and produces the best results when using a fluff pack in a phunnel bowl. Always mix up your tobacco to redistribute the copious amounts of juices you are sure to find throughout the Fantasia blends and then sprinkle it in producing a fluff pack. Just use your thumb and index to lightly drop in the tobacco up to the rim but not over. Fantasia isn't very heat sensitive so 2-3 hookah coals depending on the size of the hookah bowl is usually perfect so long as it is not over packed. 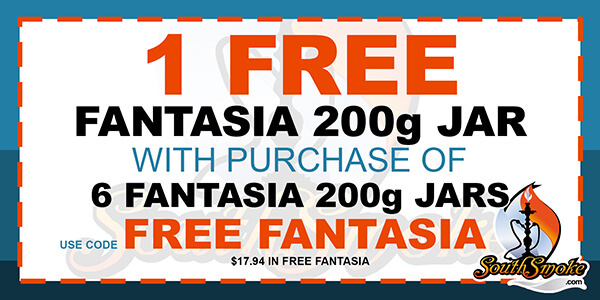 For more details regarding the Free Fantasia Tobacco 200g Promotion, please click here.